The most affordable Android smartphone with built-in TV tuner is finally here! For only Php2,699 (SRP), the Cherry Mobile Spark TV is one of the new Android phones that came out since the recent announcement of the Cherry Mobile Festival 2013. The budget TV Android also boasts a dual SIM, dual standby capability, 1GHz processor, 3.5-inch HVGA capacitive display, 2MP main camera (VGA front), FM radio and runs Android 2.3 Gingerbread. More about the Cherry Mobile Spark TV specs and features after the jump. When you think “budget”, it normally means that you are getting a cheap handset that doesn’t have much going for it. Not the Cherry Mobile Spark TV: it might have a lower price point, but the feature set won’t leave you wanting. With its decent 3.5” capacitive touchscreen powered by a 1GHz processor with 256MB of RAM, handles browsing your favorite websites, playing games and movies, as well as other computing tasks with relative ease. That is not bad at all, considering the price point. It’s not a double-digit megapixel camera, but do you need the higher numbers anyway? Unless you plan on printing out your special moments on a huge piece of board, then 2MP on the Cherry Mobile Spark TV should be more than enough to capture the memories through your everyday beautifully enough. When you do, you can then share these memories with your friends and loved ones via Facebook, Twitter, or pass them on via Bluetooth. Building on the older Android platform, the Spark TV uses an operating system that is stable. You could even say that the passage of time has only allowed its creators to work out the kinks that would normally accompany each new release. This particular iteration is well-acknowledged for being reliable in a pinch and still more than capable of handling most of the popular applications available on Google Play. Availability/ Release Date: Out now | Now available at Lazada Philippines! 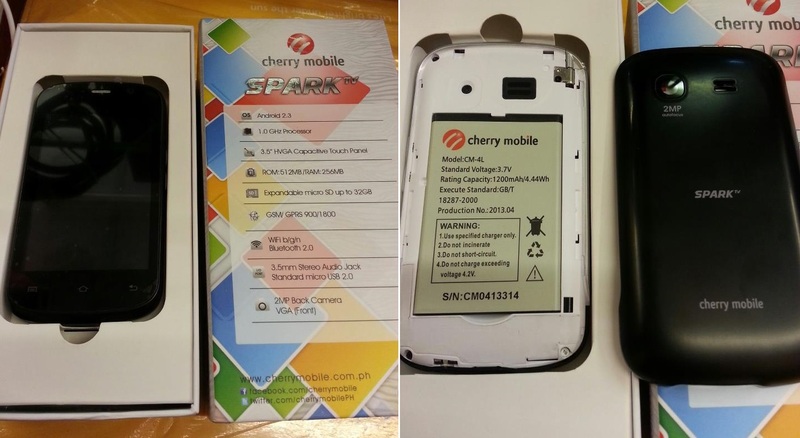 (04/27/13) Cherry Mobile Spark TV retail box and specs. 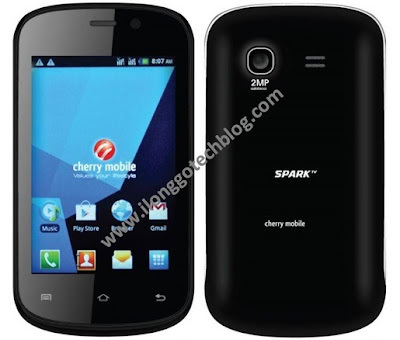 I own a Cherry Mobile Spark. It's a nice phone but there are some cons. But hey, you get what you paid for, right? >> The "2 mpx" back camera - Photos taken with the back camera ranges from "so-so" to "absolutely horrible". Even in optimal lighting conditions, photos look like it was shot using a VGA camera. Heck, even an old Nokia N70 or the front-facing cam takes better photos than the one in the back. Might look good when viewed from the phone itself. But once you transfer it to your PC, it's game over. >> You can't turn the camera sounds off - The camera sounds (shutter and "autofocus") are really, really loud. What's bad is that it is perpetually turned on, even in silent mode. *beep, beep... chak! * You can't take photos in peace, 'coz the camera on this one is a sure head-turner. >> Lag - Most noticeable while browsing. But sometimes, even mere texting can cause *severe* lag. >> Sim Card Confusion - You would notice that the Sim 1 and Sim 2 slots are incorrectly labeled. The Sim 2 slot is actually the system's Sim 1, and vice versa. >> No accelerometer. - No tilting. For me' it's a good basic phone. As long as you don't install memory/processing-intensive apps, you'll do good. Just watch out for the occasional lag or system freeze, though. Also, I can only wish that CM addresses the "immortal camera sounds", it's the least they can do for those who want to use the Spark as an on-the-go camera. is it possible for Spark TV to be rooted or any available custom rom? Any Custom Rom for this? Or how to put CyanogenMod? may wifi po ba yan?? Sa specs po my kunting changes pa yan.